Whether you’re just beginning to pick up the game or you’re looking to take your shuffleboard skills to the next level, everyone can use a few pointers every now and then. Shuffleboard is a game of strategy, finesse, and pure guts. 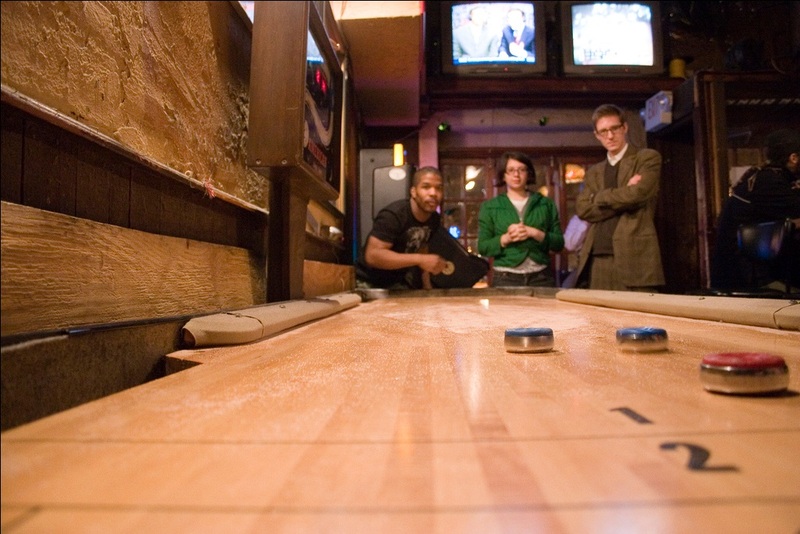 Table shuffleboard requires precise hand-eye coordination and a firm understanding of geometrical angles and the forces of physics. Now let’s take back a step. Although some would say it has its own science, you can improve your game by doing a few simple things. Here are some table shuffleboard tips compliments of your friends at Shuffleboard.net! Let’s start with the basics. When waxing your shuffleboard, act like you know what you’re doing. How do you do that? At the beginning of a new game, wipe the board clean of old wax shavings. Then sprinkle on your own special concoction that marries you and the board as one (seriously). Be slow and decisive about it. Now this of course, is just to teach you how to walk the walk. Learn how to wax a shuffle board table. Choosing the right shuffleboard wax is a-whole-nother topic that deserves a separate entry. 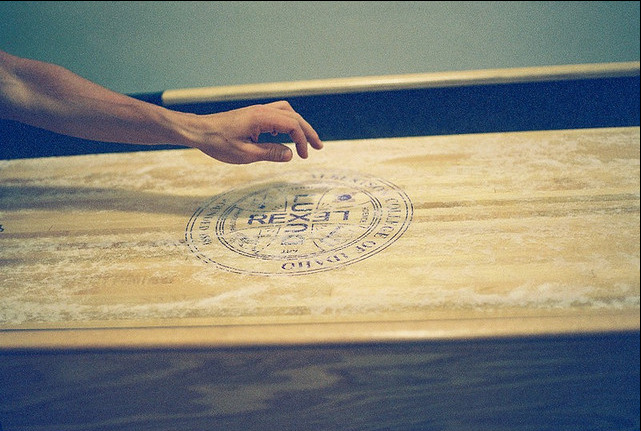 Learn how to choose shuffleboard wax here. Throwing a rail shot is key to prevailing in your bout with an opponent. Give it a good bear claw, you know the shape you make with your hands when you go “Rawrr!” You should be able to pick up a small tennis ball with the same form, just bend your fingers to a natural curve and feel the weight in your hands. Throwing a good shot is all about the release. It’s a combination of power and timing. The earlier you release your weight, the more power you will have and it will go farther. Use this technique to judge how far you would like your weight to go. This depends on if you’re shooting for four points or just hoping to bump somebody else. Holding onto the weight longer will improve accuracy. You should do this when you are trying to hit a difficult shot, maybe a weight is in the way or you have a weird angle to work with. They saying holds true with table shuffleboard. “Keep your eye on the ball” – well the weight in this case. Aim and accuracy will come with experience and it’s a skill that you will have to hone over time. Bend down to table level and grasp the weight with your fingertips. Image via Wikipedia. If you notice your shot always goes two inches to the right, aim two inches to the left and watch as you hit the mark exactly where you were aiming for! When you approach, take your time. Bend down to see a level view of the board and to understand where the wax is spread out. Just so you know, it is acceptable to pick up extra shavings and toss them on the board while the game is still going on. Do this if you want a slicker surface. Stay tuned for more table shuffleboard tips as we continue updating our blog! ShuffleBoard.Net is you’re one stop shop for all of your table shuffleboard needs. As the name implies, we specialize solely in shuffleboards meaning we know about the game and how to pick out the best board. Stop by and visit our Homepage the next time you need some new gear! This entry was posted in How to Play Shuffleboard by admin. Bookmark the permalink.